FACT: If there were no Auburn Elvis, the world would be without the best rendering of the Houston Nutt Face ever. Nor would we have ever known that the Blessed Individual daydreamed about us. Because it is The Tiger King who continues to bless us with tickets to the games he cannot attend—he wants to be involved in his son’s life; a lot of Auburn fans are like that—and with those tickets we thee bless. If you only you can make us a great poster. And pretty quick (like always). Yes, lacking the skills and tools necessary for proper design, we turn to our readers for help in creating a poster advertising this website, which tomorrow turns two years old, and in so doing establish yet another last minute TWER contest. We’ll likely hang the posters up on campus. Maybe around town. Maybe above our bed. But wherever we hang them, we want them to look, you know, cool. Doesn’t have to be complicated. Doesn’t have to be saturated. Doesn’t have to be anything… other than cool. 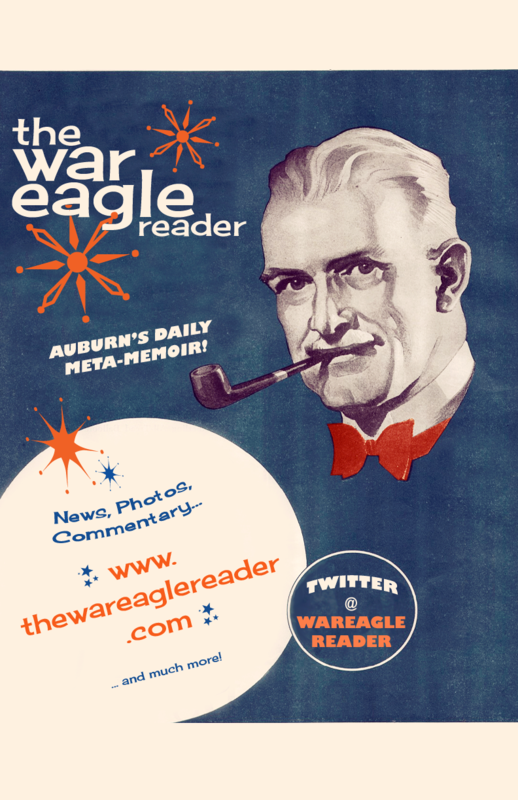 Oh, and it also needs to (somehow, somewhere): TWER’s name, web address (www.thewareaglereader.com — ‘http://” not required) and Twitter handle (@wareaglereader). If you’d like to also weave in our inscrutable slogan “Auburn’s Daily Meta-Memoir,” that’s fine. But by no means necessary.’ Come up with your own slogan. Use pictures from the site. Whatevs! (Also, I guess it needs to be, you know, big enough to send to the printer). 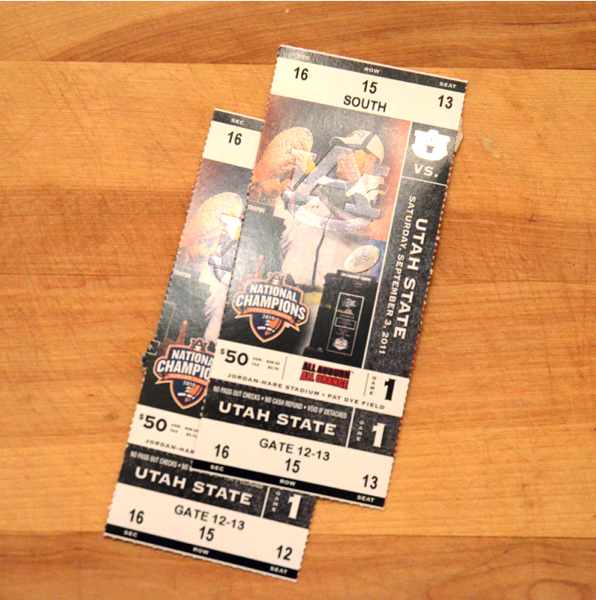 Whoever can deliver the coolest of the cool (as determined by our Cool Committee) by 5 p.m. Friday will get to watch the Auburn Tigers defend a national championship For The First Time in More Than 50 Years (TM) from Section 16, Row 15, Seats 12 and 13 (check out the view). And meet a TWER staffer—we have to get them to you somehow… probably meet on campus or something? So if you’ve got the time and the want-to, dig deep into that Biggin Hall-midnight-oil-inspiration deep down inside you and start rendering! Entries can be sent to [email protected] (We also welcome submissions by folks who don’t need the tickets and just want to help out for the birthday). Like Tim Cook says, let’s War Eagle Forever! UPDATE: There were several stellar entries (and if you’re on campus, you might see some of them, too), but we have (had for three days) a winner! Congrats to Auburn student Reed Dudley, whose poster employed an aesthetic that truly captured TWER’s vintage affectations—I’m blowing smoke circles from pipe right now! Thanks again to everyone who entered! And, once again, to our bodacious benefactor Auburn Elvis. If you’re interested in helping us hang posters around campus, please get in touch! no TM-d Auburn insignia allowed? So you don’t get sued…correct? Aww, go ahead and do it. We’ll just blame it on Cecil Newton if we get caught.